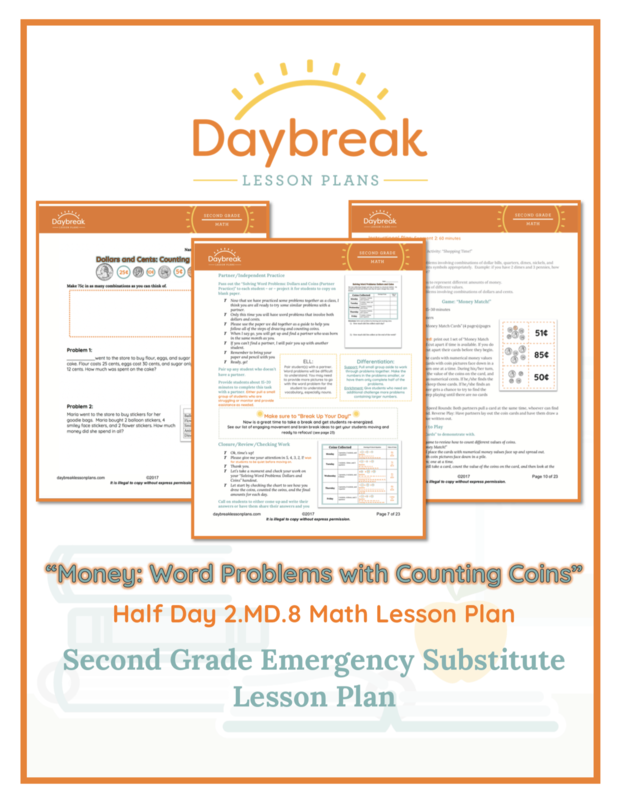 Description: Second Grade half day of math lesson plans containing 3 separate segments (30-60 minutes each) addressing Operations & Algebraic Thinking: solving word problems with an unknown total or part requiring addition within 100 (2.OA.1). 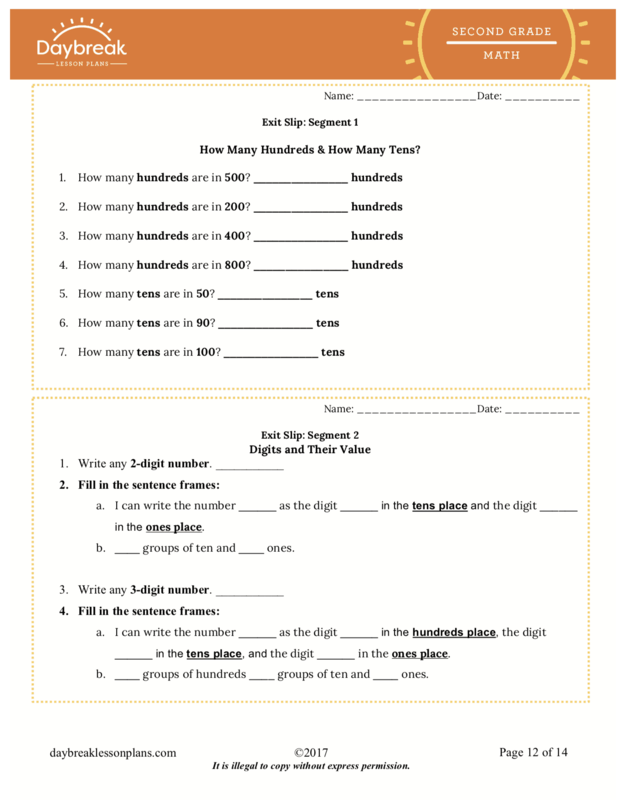 These lessons include: steps of how to solve word problems, identifying important information in a word problem, use of pictures and tape diagrams/bar diagrams to solve addition problems, and explanation of thinking and strategies used to solve word problems. 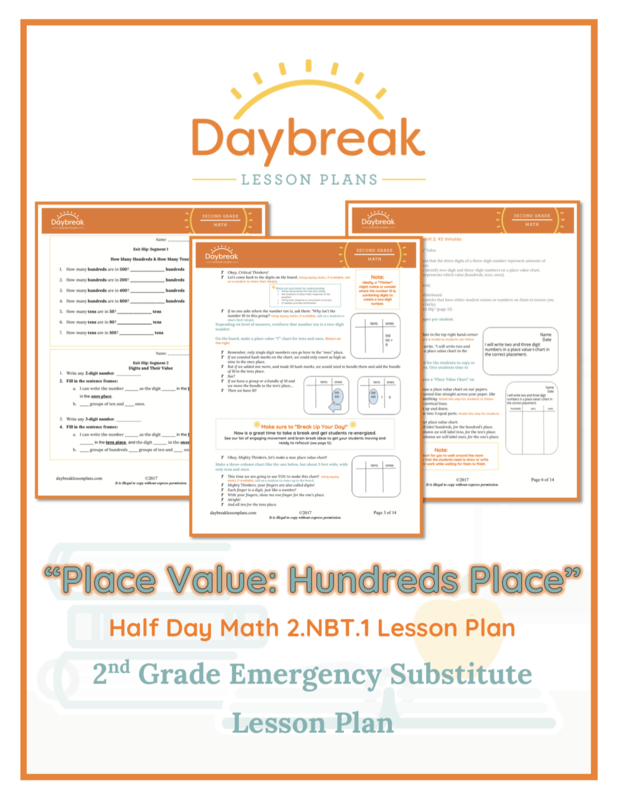 Description: Second Grade half day of math lesson plans containing 3 separate segments (30-60 minutes each) addressing Numbers and Operations in Base Ten: Place Value Through the 100’s Place . 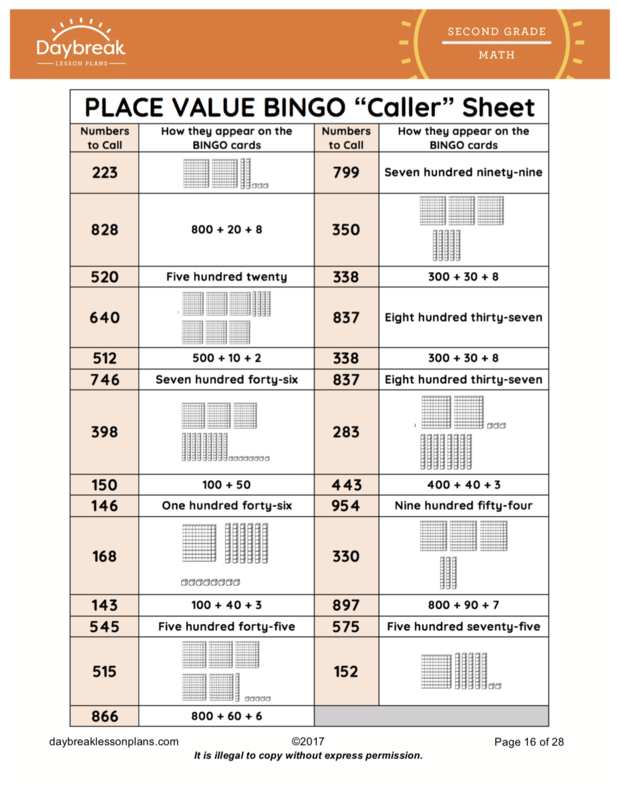 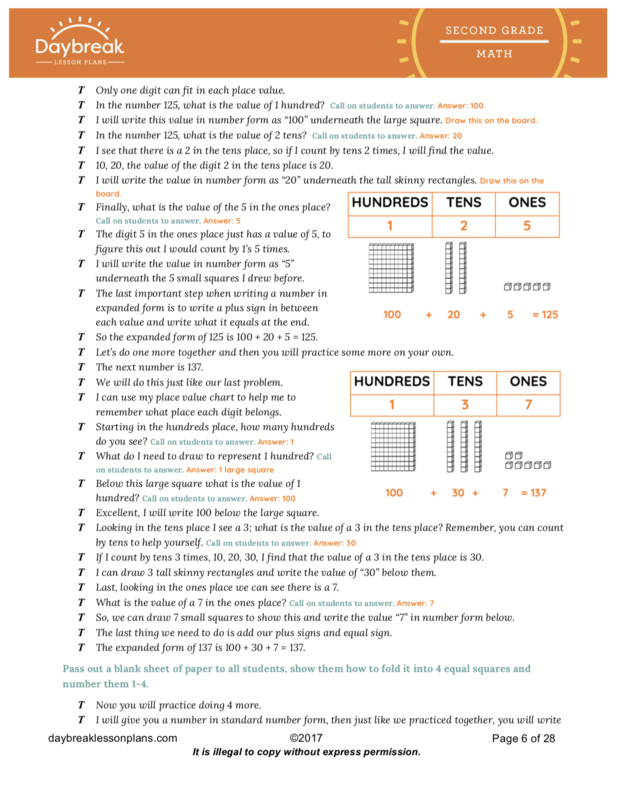 In these lessons students will participate in demonstrations of creating bundles of 10, identify values of digits on a place value chart, and play a mental math place value game. 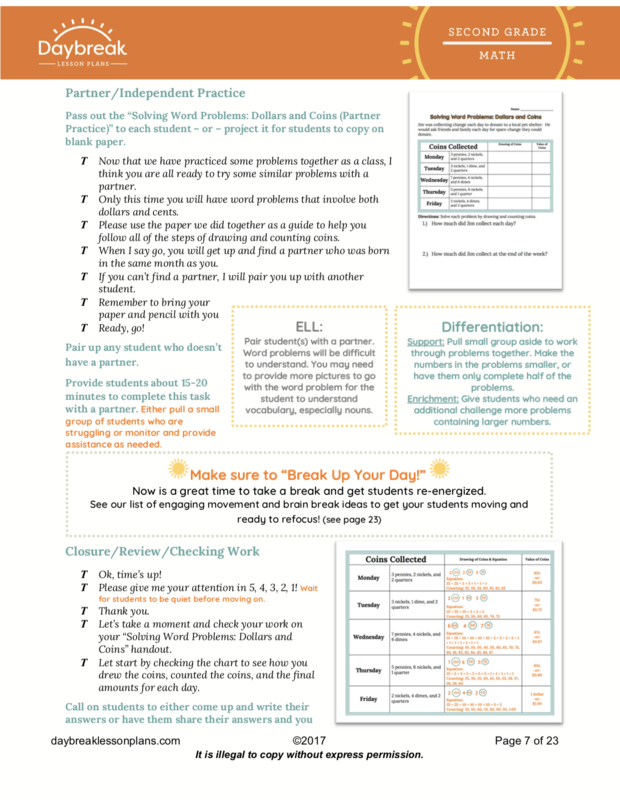 When it comes to their craft, teachers trust one another most. 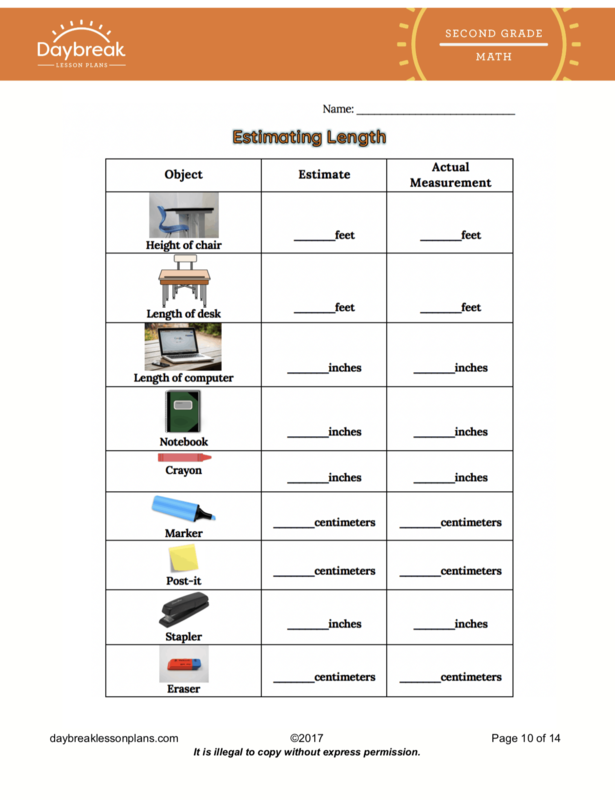 In a 2014 survey distributed by the Education Week Research Center, 87 percent of teacher respondents indicated that they trust other teachers’ claims of whether curriculum is aligned with the Common Core. 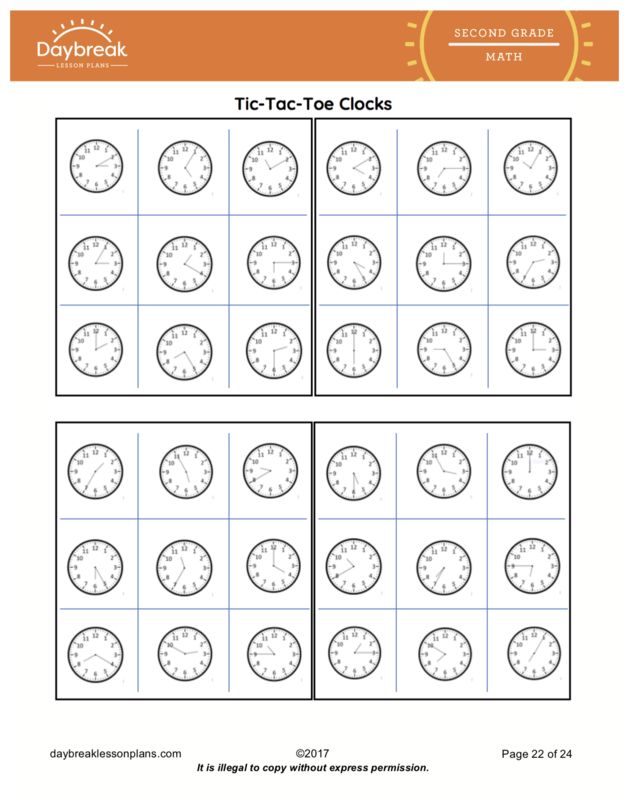 In sharp contrast, a mere 38 percent said they trust curriculum providers’ and publishers’ claims; and fewer than two-thirds report that they trust an independent panel of experts. 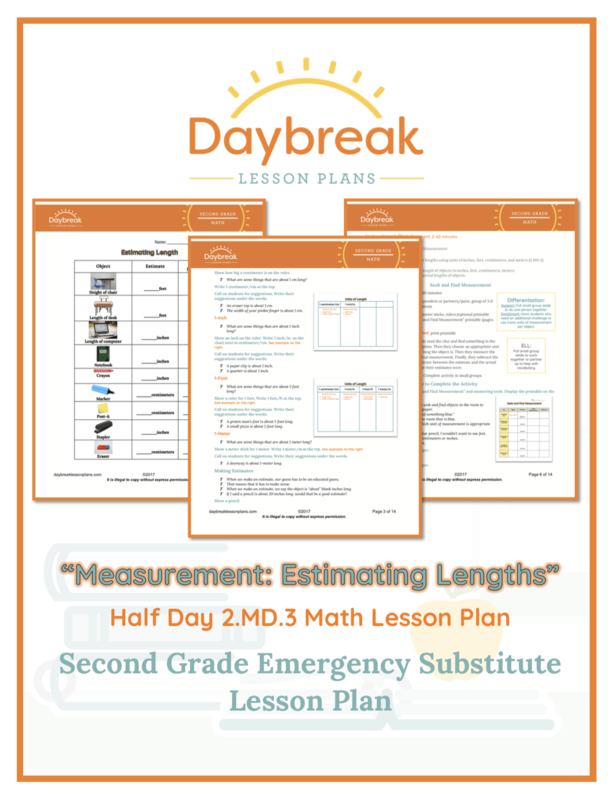 This is why Daybreak Lesson Plans lets teachers — the real-life experts — develop lesson plans for other teachers’ substitutes. 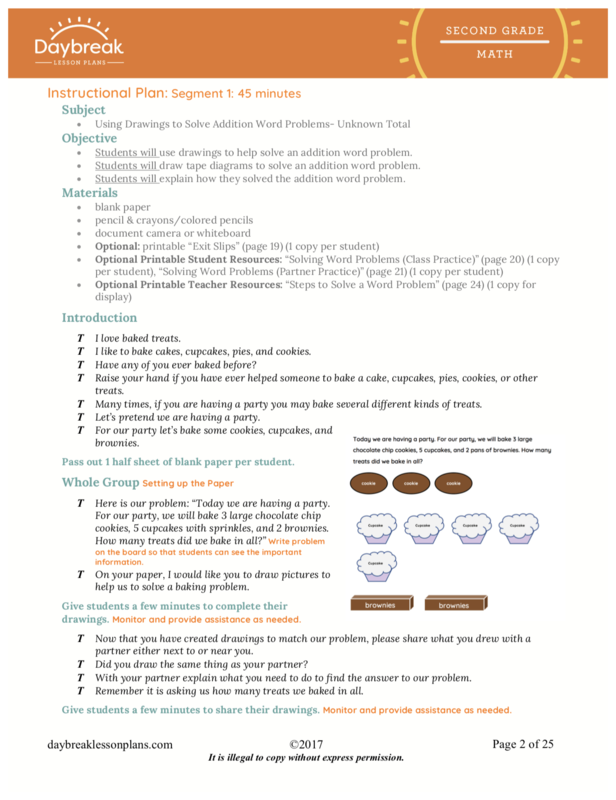 We understand that people who have the hands-on experience, who have tried curriculum on real students and discovered real results, are the ones who can effectively lead the way toward enriched curriculum planning. 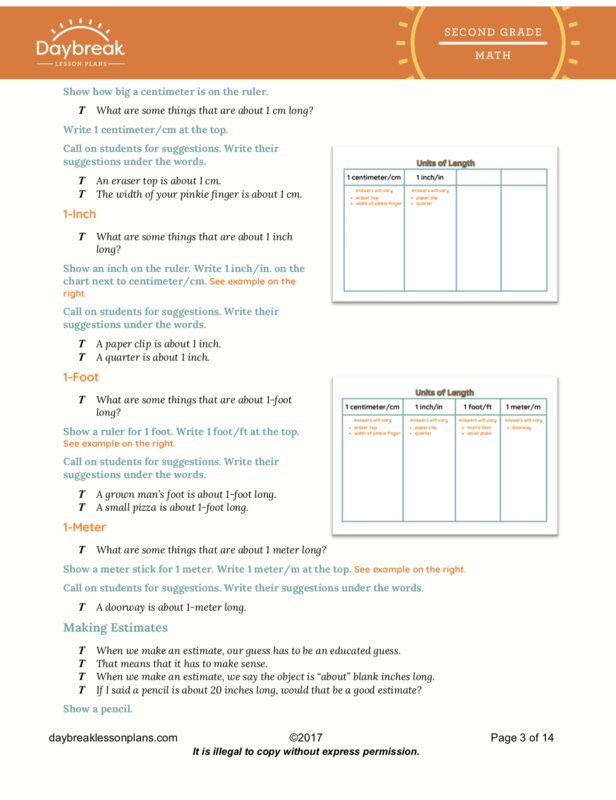 What Types of Lesson Plans for 2nd Grade Are Available? 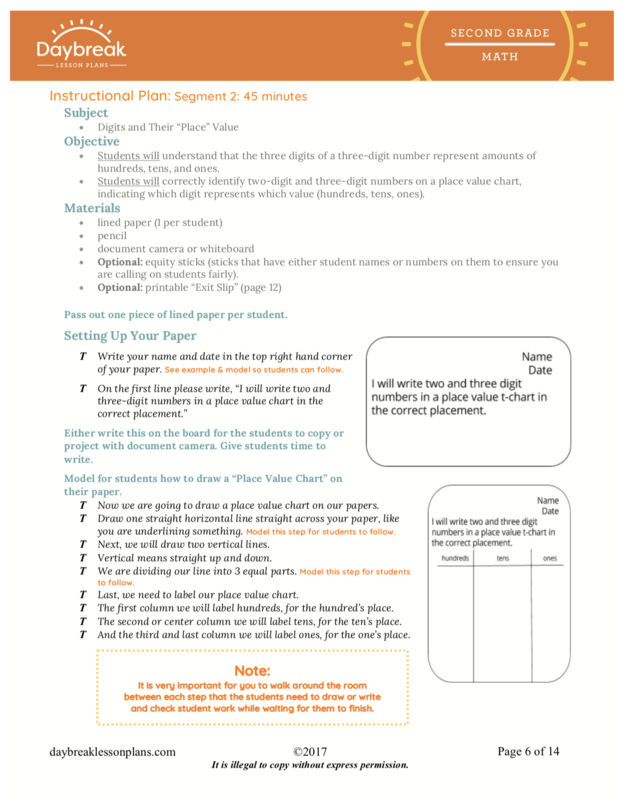 Whether you’re a new teacher trying to learn the ropes or looking for a lesson plan for your substitute teacher, we have a collection of 2nd-grade lesson plans to meet all your planning needs. 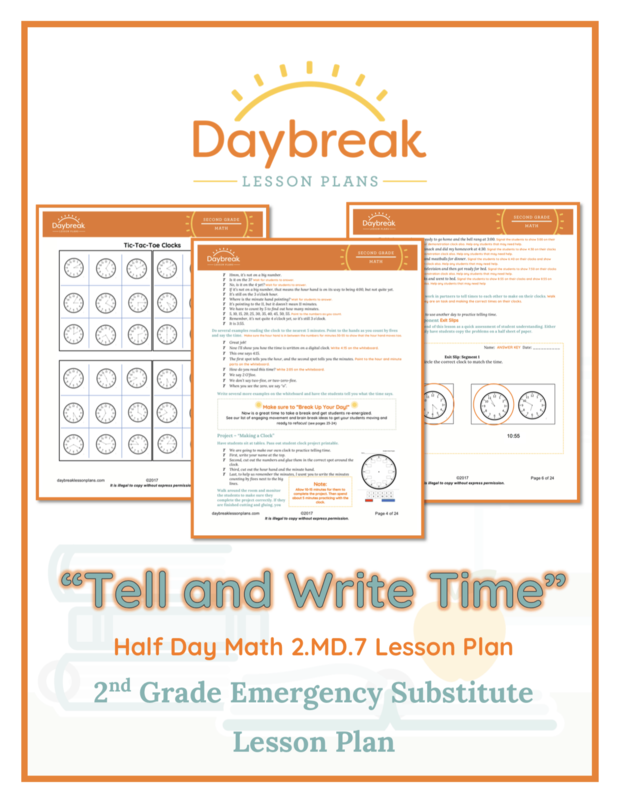 Daybreak Lesson Plans offers straightforward lesson plans that are easy for anyone to follow and perfect when you need a quick lesson plan for a substitute teacher. 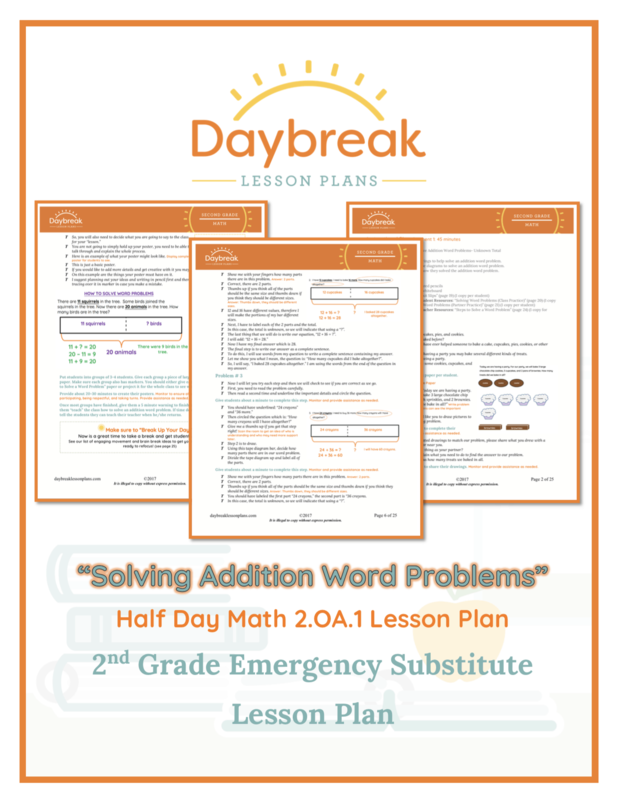 From 2nd-grade math lesson plans to reading plans for 2nd-grade to 2nd grade language arts lesson plans, our lessons accommodate a wide range of student abilities and learning styles. 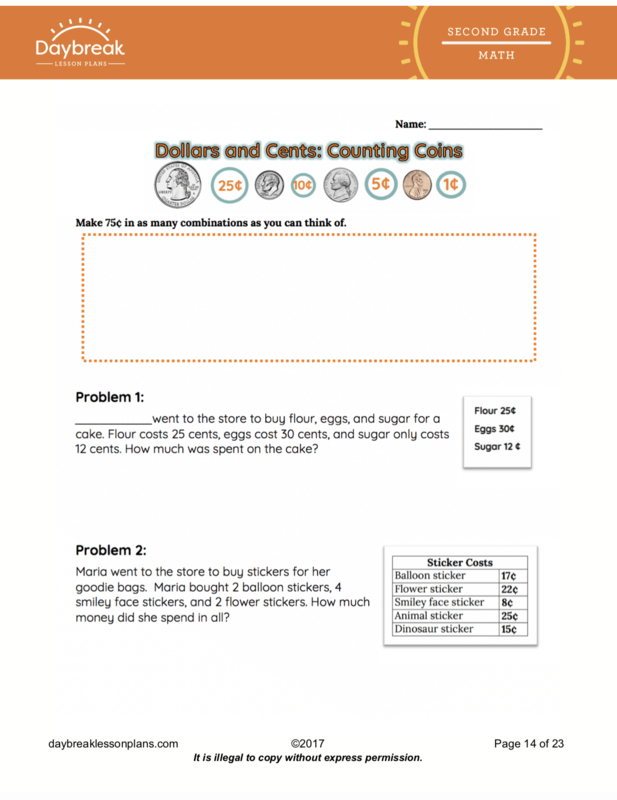 A half-day math lesson might ask students to solve word problems using combinations of dollar bills, quarters, dimes, nickels and pennies. 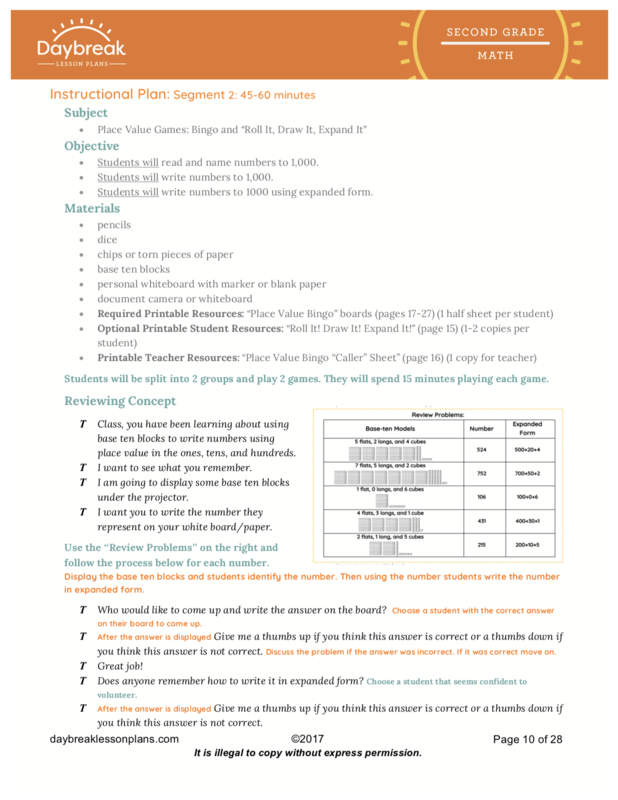 A one-hour lesson plan might have students reading about and examining roller coasters. 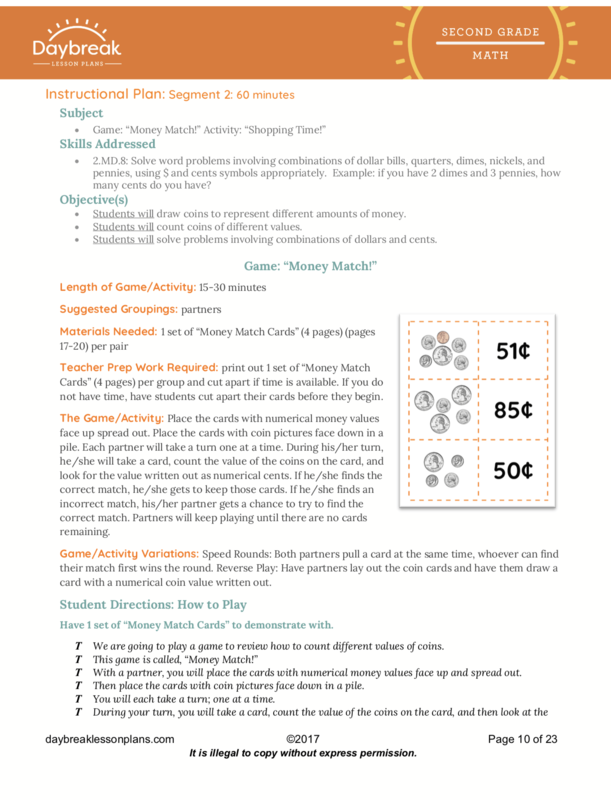 A full-day lesson might intertwine geometry with the growth cycle of pumpkins. 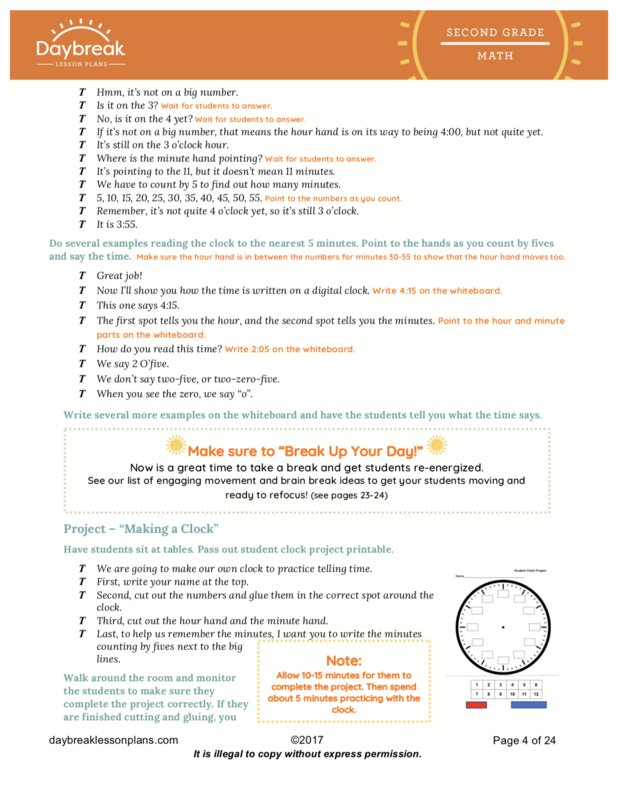 Our lesson plans are only published after looking at data — that is, the actual outcomes of students learning the material in real classrooms — and only after adjustments have been made based on that data. 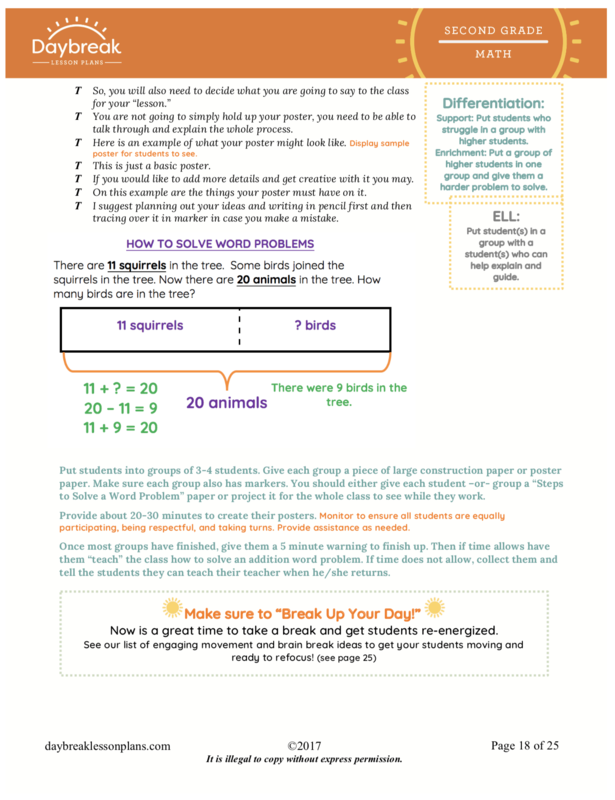 Experienced teachers who are familiar with the Common Core and its practical implications write our 2nd-grade lesson plans. 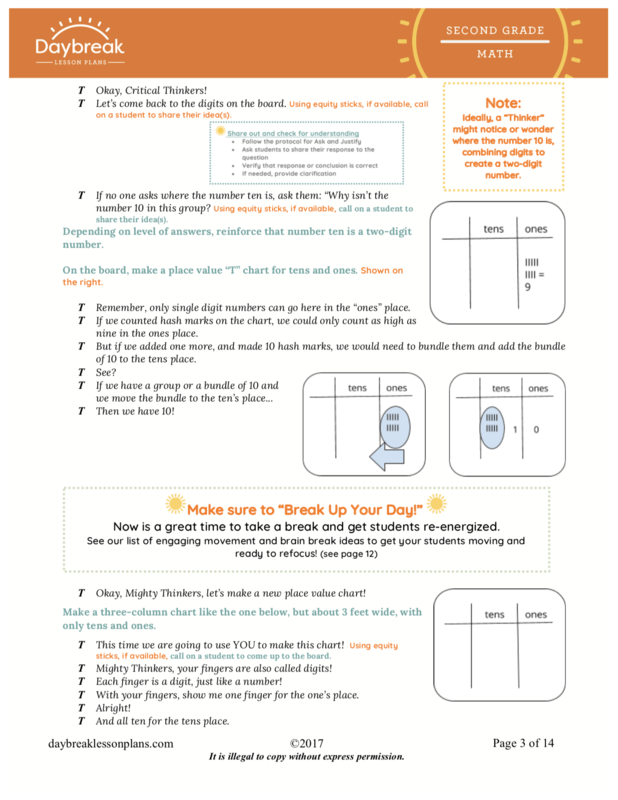 Lesson plans are fully scripted; that means a substitute or novice teacher can pick up the lesson and know exactly what to say and do to make that lesson meaningful to students. 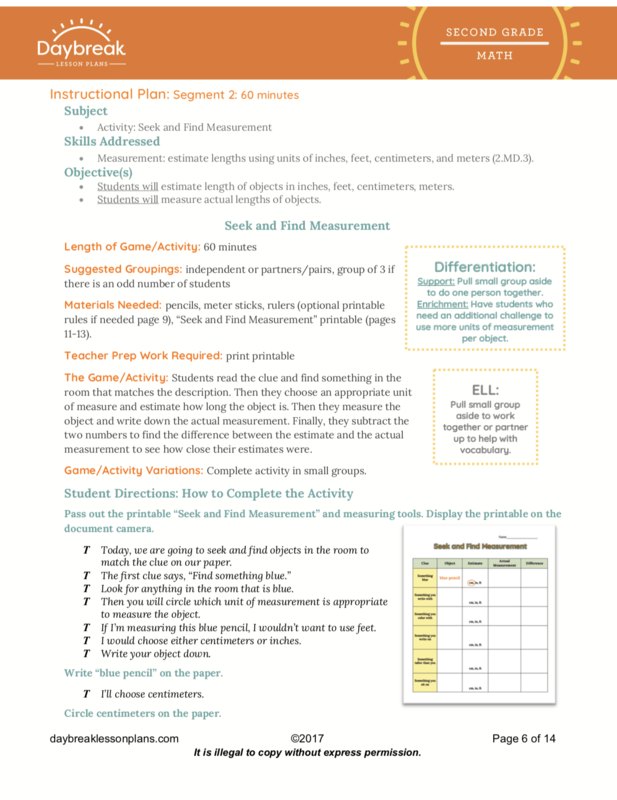 Every lesson is carefully aligned to Common Core Standards and the applicable standards are outlined for teachers to share with students. 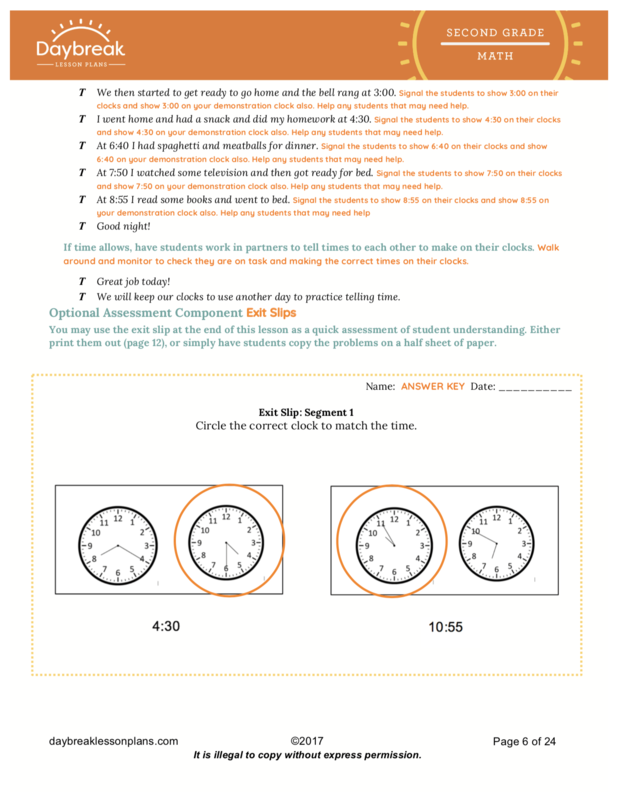 Each lesson plan takes into account different planning time needs so that lessons vary from one hour to a whole day’s worth of activities. 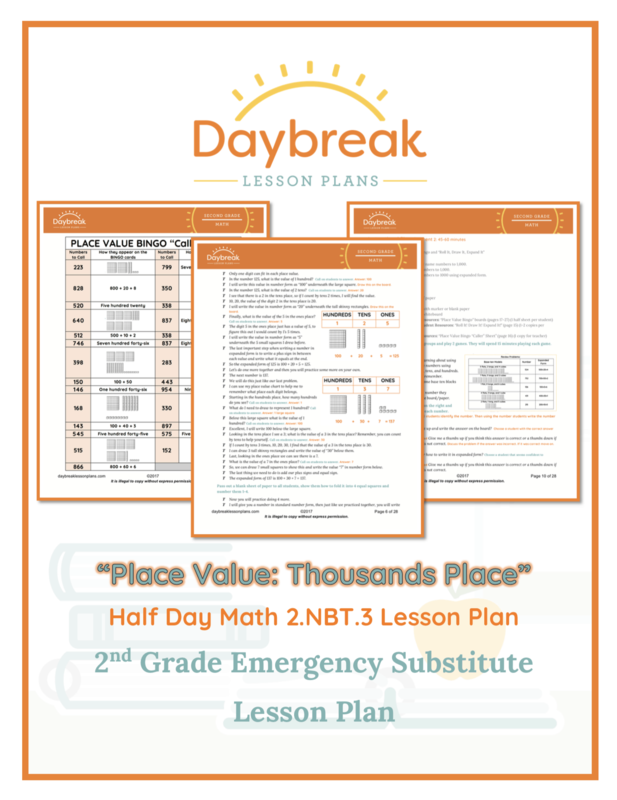 When you’re ready to quit agonizing over your next sub plan, visit Daybreak Lesson Plans. 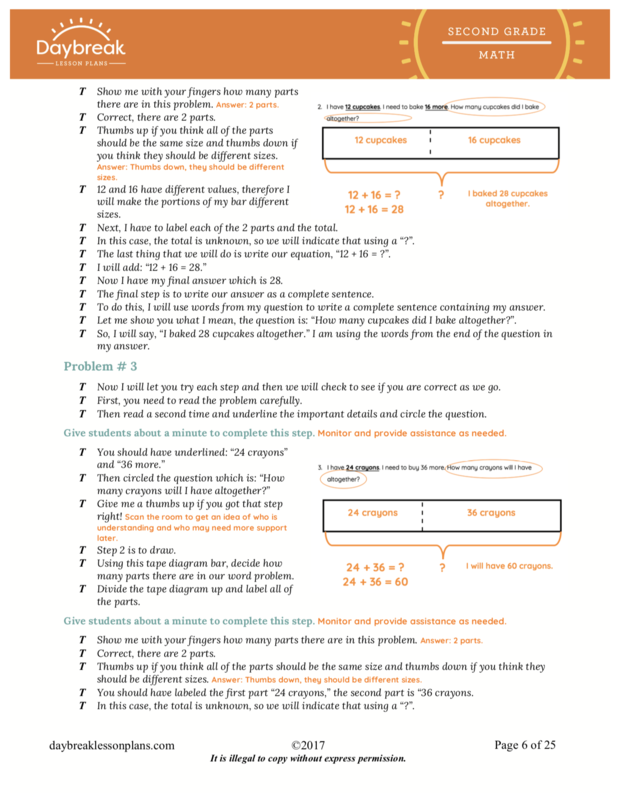 There, you can browse lesson plans and find activities suitable for any age or content area.